Based in Ireland, the client is a signage company with 15+ years of experience in the marketing industry. The client offers complete signage services including outdoor billboard signage, flex banners, and more. The client has worked on some of the biggest outdoor advertising campaigns for a global clientele. The client required 3D logo modeling and rendering to showcase their logo in different lighting conditions. The client shared their branding specifications and transferred one JPEG image via email. Three full-time resources were assigned to the task. The process involved modeling, shading, lighting and rendering final output in a PNG format with 3DS Max software. The project was completed within 36 hours. Six different variations were created for the same logo showcasing different lighting conditions (morning, night, day, halogen backdrop etc). The client secured a 60 percent cost savings and emailed our Business Development Manager acknowledging the same. At O2I we offer 24/6 support, skilled resources, and affordable costs. 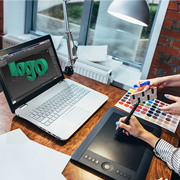 Partner with our creative team for logo design, animation, photo editing, video editing, illustrations, and more. Contact today and get a free quote within one business day.